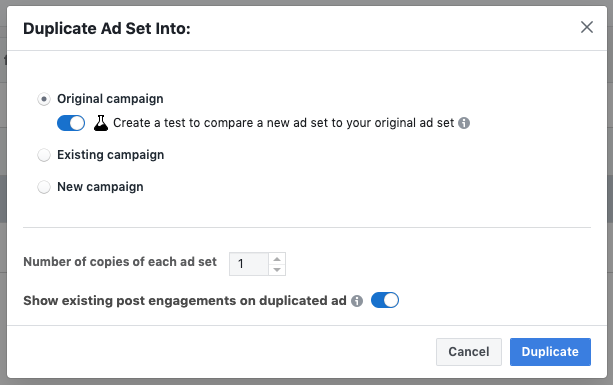 You can easily duplicate Facebook campaigns, ad sets, and ads in Facebook ads manager, so you don’t need to set up the same ads all over again in order to test them on different audiences. We’ll go through how to duplicate existing ad sets to try out a different audience (targeting is set at ad set level) and some other points to take note of. Select a campaign in Facebook Ads manager. Check the ad set you’d like to duplicate. In the upcoming dialog, you’ll have the following options. Create a new ad set in the same campaign as your original ad set. In this case, the new ad sets will share the original campaign’s settings like spend limit and objective. Create a new ad set in another existing campaign. If this other campaign has a different objective, settings like optimization and delivery will be reset. Create a new ad set in a new campaign. You can also tell Facebook to make multiple copies at once if you’d like to test several new setups. The last checkbox is to tell Facebook show the existing post engagements or not. As the ads inside the original ad set will be copied as well, they will point to the same Facebook/Instagram post. The likes and reactions you get for the original ads will also be shown under the new ad sets. Facebook provides split tests if you want to be absolutely sure there’s no overlap among audiences. In the first option “Original campaign”, you get a checkbox to create such tests. A split test generally splits the whole population into N groups, where N is the number of ad sets running in parallel. Every individual is assigned to a group randomly, and ad set targeting is applied to each group separately. 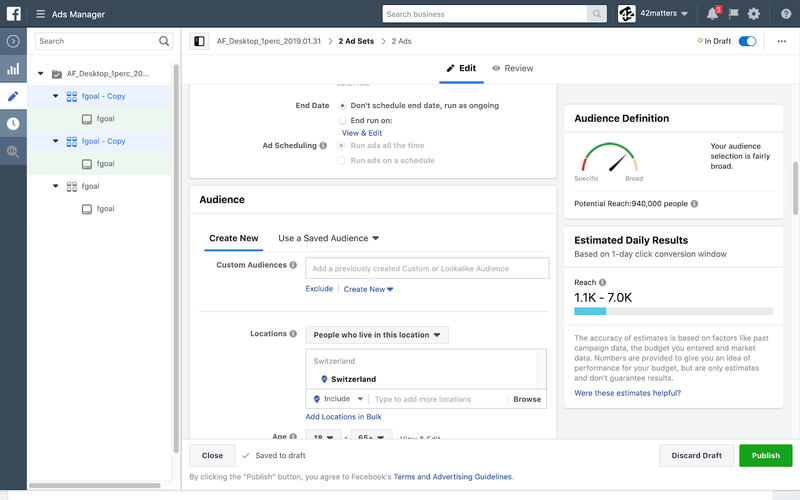 After you press "Duplicate", Facebook will prepare new ad sets in draft mode. Here, you can make changes to the ad set name, budget settings, targeting, etc. You also have a chance to edit ads in different ad sets: it’s a good practice to send different messages to different target groups. When you’re done, click the “Publish” button at the bottom right corner to submit the ad sets for review, and off you go. An example of how highly accurate audience targeting cat owners works in comparison to traditional targeting options on Facebook. Moreover, also how it can increase the specificity of your Facebook ad targeting. People loving technologies come in different shapes. Gadget fans, state-of-the art lovers, simple tech enthusiasts… Then how can you target them efficiently for your marketing? Find out how!